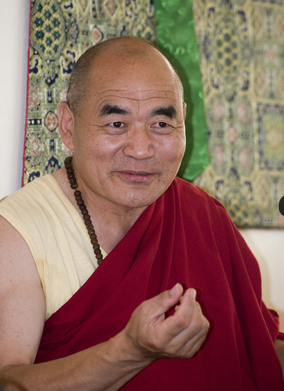 The Ayurveda Polarity Therapy & Yoga Institute was pleased to welcome the Venerable Traga Rinpoche, Tibetan Buddhist monk and yogi, who spoke eloquently on the Compassion and Bodhicitta of Chenrezig, May 1 and 2, 2009 in Santa Fe. People are gathered here for the opening event, which benefited the children of Chethak Ruchen School in eastern Tibet and the building fund for Rigdzin Dharma Foundation in Albuquerque, New Mexico (www.rigdzin.com). Traga Rinpoche holds lineages from both the Kagyu and Nyingma schools of Tibetan Buddhism; he is the spiritual director of Rigdzin Dharma.